"Okay, I've got some good news and some bad news....." I posted this yesterday and somehow it disappeared. I know the blog site was having some technical difficulties. I'll try to recreate the gist of it. Well, starting with the good news, I had requested some Khmer (Cambodian) language materials at one time from Here's Life Australia, a ministry of Campus Crusade for Christ. 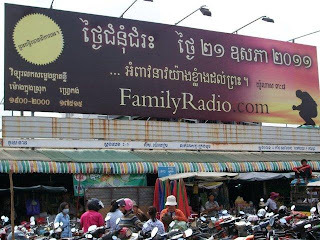 I received an e-mail from them the other day saying that they need to recruit help from someone who can read and write Khmer for online evangelism and discipleship via e-mail. They are receiving 10 e-mails a day from people in Cambodia who want to know more about Jesus! It is so exciting to me to see how God is at work there, opening their hearts and minds to want to know Him. Now for the bad news. There are people there, just like here, who are distorting the message of the gospel. Maybe you've seen billboards proclaiming May 21 to be "judgment day." A misguided individual has convinced himself and wants to convince others that he can prove from the Bible that May 21 is the beginning of God's' judgment on the earth. He is spreading this misinformation through billboards around the United States. Well, apparently they have made their way to Phnom Penh, Cambodia as well. I'm sad to see Christianity represented in this way in a place where so many are in need of the true knowledge of Christ. Please join me in praying that people will not be deceived and subsequently disillusioned with Christianity by association with this false teacher. Pray that young believers there will not be confused and taken in by this teaching and that the believers there will be equipped and motivated to spread the real Good News! !